PwC Executive Director Costas Mitropoulos. Half of the hotels in Greece are “Stars”, companies with systematic revenue/profitability growth and sustainable debt, while 25 percent are “Zombies” with lower revenue, negative or zero profitability, and unsustainable debt, according to a report by PricewaterhouseCoopers (PwC). 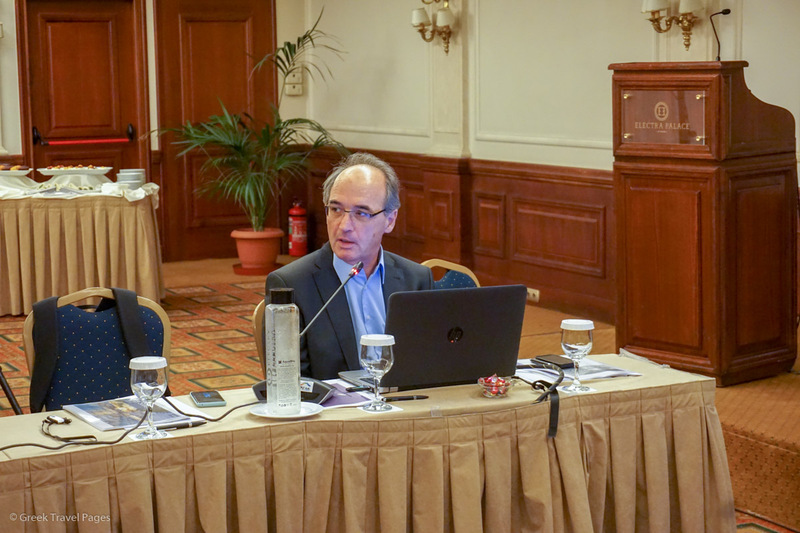 INSETE Research Director Dr. Aris Ikkos. 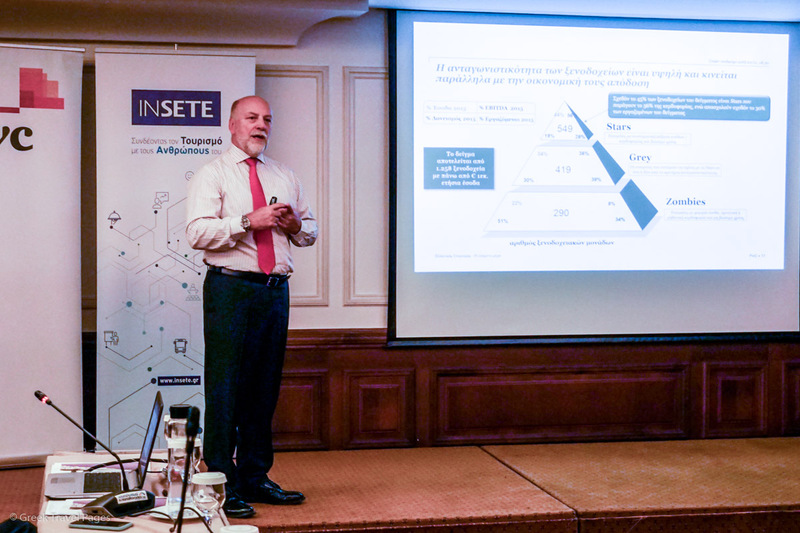 Titled “The next day of Greek Tourism”, PWC’s report was presented on Tuesday, alongside the Hotel Study by INSETE, the Greek Tourism Confederation’s (SETE) intelligence body, which analyzed financial data of hotels in Greece by destination and star rating. Both studies focus on the structural analysis of the Greek hotel sector with conclusions that extend to the entire Greek tourism sector. PwC’s report underlined that hotels in Greece are in general internationally competitive. 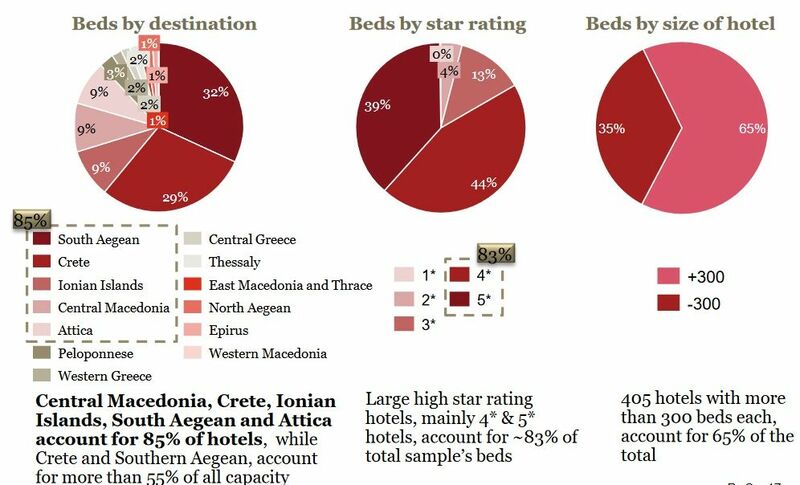 Greece’s hospitality industry is split between “Main Destinations “ (Central Macedonia, Crete, Ionian Islands, South Aegean and Attica) and “Lesser Destinations” (Peloponnese, Western Greece, Central Greece, Thessaly, East Macedonia and Thrace, North Aegean, Epirus, Western Macedonia). 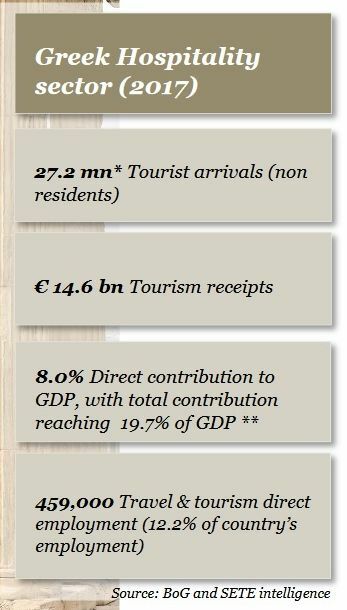 “Main Destinations” account for 85 percent of all hotels in Greece. To offer better understanding to hotel economies, PwC analyzed a sizeable sample comprising 1,258 hotels with annual revenues in excess of 1 million euros. 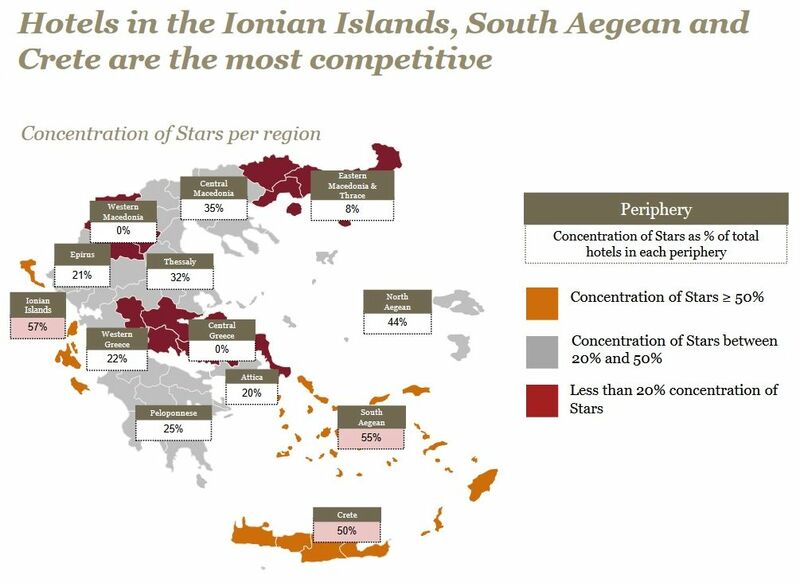 The “Star” hotels seem to populate the country’s “Main Destinations” located in the most competitive regions of the Ionian Islands (concentration of 57 percent), South Aegean (55 percent) and Crete (50 percent). “Star” hotels also tend to be in the 4-star category and in small size units. “The typical ‘Star’ hotel company tends to be small with annual revenues between 3.5 million euros to 5 million euros, enjoying consistent high growth and good capital returns,” the report says. Meanwhile, most of the “Zombie” hotels reside in “Lesser Destinations” and tend to be large and five-star rated. According to the study, Greek destinations are in general oversupplied and only in the peak season a shortfall of capacity is noticed on Crete and in the South Aegean and Ionian islands. These destinations are expected to need about 24k additional beds by 2022, to meet demand during peak months. “About 90 new equivalent hotels will need to be constructed within the next 5 years to meet demand in the three main destinations that are close to full capacity,” the report underlines. PwC’s report finds that the total hotel investment needs in Greece are estimated at around 6.2 billion euros over a five year period (2018-2022) and are split into 1 billion euros for construction of additional beds, 4.8 billion euros for capacity upgrade and 0.3 billion euros for heavy maintenance. As pointed out by PwC’s report, the most promising investment strategy, in terms of value potential, appears to be the development of “Lesser Destinations”, followed by upgrading 4-star to 5-star hotels, and adding capacity to existing 3-star hotels. The report also underlined that there is a need to restructure 342 “Grey” (hotels lagging behind compared to “Stars” in terms of competitiveness) and “Zombie” hotels to make them financially sustainable in the long run before any new investment can take place. Regarding the short-term rental market, the report said that at its current state, Airbnb-style rentals add supply to the market – about 96k beds (12 percent) – without being disruptive. Supply is concentrated in city and prime resort destinations with most of the short-term rentals being active for 1-3 months throughout the year. Most registered rentals are located in Crete, which accounts 30 percent of total rental activity, while Athens is following with 17 percent. EU-28 countries are the main source of tourists for Greece, accounting for 68 percent of the total and showing a 40 percent increase between 2014 and 2017. Four countries (Germany, UK, Italy and France) account for 35 percent of all arrivals while five destinations (Crete, South Aegean, Central Macedonia, Ionian Islands and Attica) accept 87 percent of all incoming tourists. 2017 was another record year for tourism in Greece in terms of arrivals, the direct contribution of Tourism to GDP rose from 5 percent in 2010 to 8 percent in 2017 (14.3 billiob euros). Despite the sharp gains in tourist arrivals, receipts are lagging behind mainly due to shorter stays. “The drop in tourism receipts may be partly attributed to Airbnb users, whose expenditure is not recorded,” the study notes. “The next day of Greek tourism will be good but it can be even better with the partnership of the public-private sector,” the report says. Moreover, the study focuses on the fact that there are few specific risks in the horizon to deter future growth, and most of them are encapsulated in the “typical tourism cycle”. 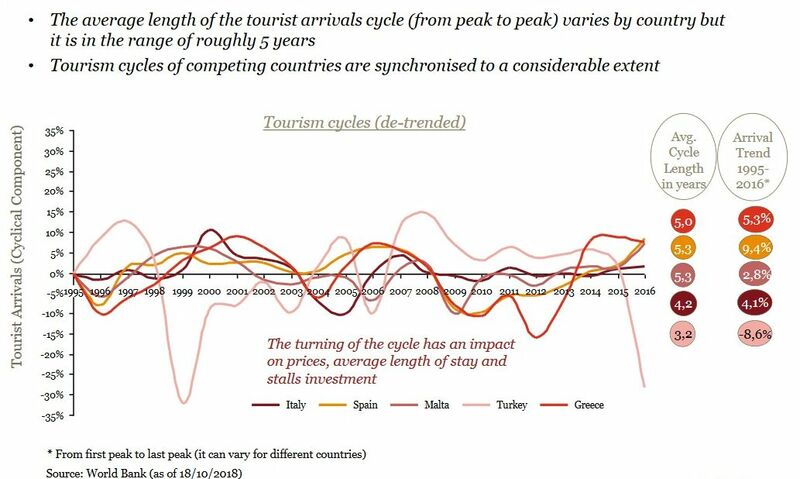 “The single most important risk is demand’s downturn in the tourism cycle we are currently riding,” PwC notes, underlining that tourist cycles are the result of a blend between origin economics and tourist patterns, as well as of competition between destinations. According to the study, tourist cycles typically average 5 years and they are constantly upwards trended, very rarely leading to a real reduction in tourist flows and income. While mentioning that Greece is in the “upside” of its current cycle and should expect a slowdown in tourism activity, it concludes that any slowdown inevitably impacts pricing and average stay and delays investment. To ready the whole study, press here.